:: Brazzil magazine, September 2000. To some, it represents the contamination of Brazilian music by U.S. imperialist culture. To others, it is a source of pride as a native genre that conquered the world. Brazilians have long been leery of U.S. intervention in their country’s politics and economics, and this outlook has led in some cases to cultural mistrust as well. As early as 1922, when Pixinguinha and his Oito Batutas returned from their trip to Paris, they were attacked for having polluted their choro with jazz arrangements. These attacks didn’t stop jazz from becoming all the rage in Brazil during the ‘20s, and soon many an orchestra and conjunto had no choice but to heed the trend and call themselves jazz bands. Despite the occasional brouhaha, jazz continues as a legitimate Brazilian expression that has sprouted numerous sub-genres ranging across the musical spectrum from the classic acoustic piano/bass/drums formula of Zimbo Trio to the electric/electronic mixes of Azymouth. This article is by no means a comprehensive survey of current Brazilian jazz. Rather, it is a selective look at a few of its interesting expressions around the globe. Tríade is an accomplished acoustic trio whose mission is to seek new ways in which to promulgate the tradition of piano jazz trios in the line of Bill Evans and Keith Jarrett, as well as that of acclaimed bossa nova piano trios such as Zimbo Trio and Tamba Trio. Tríade, however, uses no piano. Its melodic instrument is the guitar, in 6- and 12-string variations. In its musical style, Tríade follows the Brazilian evolutionary process defined by Hermeto Pascoal and Egberto Gismonti. The ECM sound, evolved by artists who record on the German label (Gismonti and Jarrett among them), is a strong reference for Tríade’s sonority and timbre. Improvisation also plays an important role in the group’s music. 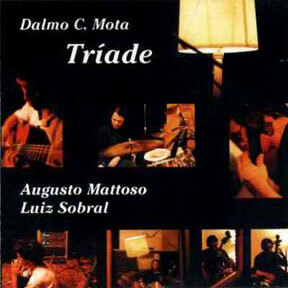 Established in 1991, Tríade is made up of Dalmo C. Mota (6- and 12-string guitars, berimbaus, and voice), Augusto Mattoso (contrabass), and Luiz Sobral (drums). Dalmo C. Mota studied guitar with Aloysio Neves, classical guitar with Léo Soares, and improvisation with Nélson Faria. His guitar style evokes improvisational piano playing. Dalmo has also researched alternative techniques for playing the berimbau, which is transformed in his hands into an unexpectedly lyrical voice. Augusto Mattoso began as a guitarist but soon became the disciple of illustrious contrabassist Paulo Russo. He has played with the Rio Jazz Orchestra, Brasil Barroco Coro e Orquestra, Dário Galante, Pascoal Meirelles, and Guilherme Dias Gomes. His major bass influence is Eddie Gomez. Luiz Sobral began as a percussionist in 1977 with the choro group Rio Antigo before switching to drums. His eclectic career includes work with such diverse artists as sambista Jorge Aragão, romantic singers Marisa Gata Mansa and Tânia Alves, soul/funk diva Sandra de Sá, and reed player Dirceu Leitte. Sobral’s drumming role models are Robertinho Silva and Jack DeJohnette. Tríade’s eponymous first CD (independent) showcases Dalmo’s compositorial abilities (all but two of the compositions are of his authorship), as well as the group’s inventiveness in improvising. The disc opens with “Janeiro,” a samba composed in January, inspired by the energy and activity of Rio de Janeiro during this summer month. Next comes the suite “Reinvenção do Homem” (Reinvention of Man), whose three movements, says the composer, “trace the process of change through which the human race is passing in this moment of crisis and worldwide imbalance.” ‘Urgência de Mudança’ (Urgency of Change) is the lively first movement, followed by the introspective ‘Voz Interior’ (Interior Voice) and the totally improvised ‘Superação do Ego e Unidade com o Todo’ (Overcoming the Ego and Uniting with the Whole). In this third movement, the music rises to a chaotic climax, followed by a serene resolution. “Ila” is a slow bossa nova reverie composed by Augusto and inspired by a beautiful woman. “Morro Velho,” composed by Milton Nascimento and previously recorded by Elis Regina, receives here a faster pace and alternation of speeds that enhance the tune’s descriptive character. “Berimbaus” is a four-movement suite with a closed structure, turning around rhythmic-melodic cells played on tuned berimbaus, with Dalmo using alternative techniques such as double notes, pisadas (pressing the berimbau string while hitting it), and harmonics. It begins with ‘Introdução,’ a light counterpoint between berimbau and bass, followed by ‘Dança,’ an accelerated movement based on the play of rhythmic cells executed by berimbau and drums, with rhythmic vocal interventions and melodies laid over by the bowed contrabass. The third movement, ‘Cadenza,’ explores various berimbau-playing techniques augmented by melodic vocalese that at times harks back to Jobim’s “Chovendo na Roseira.” The closing movement, ‘Coral e Melodia,’ begins with choral harmony executed by bowed contrabasses and two berimbaus and continues with a sung lyrical melody on top of the bass/berimbau harmony. The bass takes center stage executing the theme in “Pra Tudo Dar Certo” (For Everything to Turn Out Right), a rapid samba in which the individual solos give way to intense mutual exchange among instruments. The penultimate track is “E a Lua no Céu” (And the Moon in the Sky), beginning with a slow impressionistic guitar part whose melody is repeated in counterpoint, then reiterated faster and more rhythmically. The disc closes with “Malambo,” inspired by Afro-Latin rhythms and featuring a spirited drum solo. Aloysio Neves is a multi-instrumentalist who plays acoustic and electric guitars, saxophone, piano, and drums. He’s also a composer, arranger, conductor, teacher, and bandleader. His hybrid classical/popular education included guitar studies with Iron Lima (Conservatório Villa Lobos in Manaus), Léo Soares (Seminários de Música Pró-Arte), and Turíbio Santos (Uni-Rio), as well as theory with Bohumil Med (Curso Internacional de Férias da Pró-Arte) and electric guitar with the American Joe Diorio. As guitarist, he’s been a member of Orquestra de Violões do Rio de Janeiro, Quarteto Carioca de Violões, Aloysio Neves Trio, and Duo Flavio Goulart/Aloysio Neves. Neves is the conductor and music director of the Orquestra Brasileira de Guitarras, founded in 1986 and a pioneer in the use of electric guitars in a polyphonic orchestral setting. Pursuing the ideal of Free Music, the orchestra has sought to rethink, recreate, and synthesize major 20th-century movements as diverse as atonalism, neoclassicism, modalism, 12-tone and serial music, various manifestations of jazz (including the ECM sound), MPB, Hermeto Pascoal’s and Egberto Gismonti’s music. The orchestra’s second CD, Amálgama (independent), featuring the band’s original compositions, was awarded five stars by Brazil’s foremost jazz critic, José Domingos Raffaelli, and is spotlighted on the MP3.com website (see link under Contacts & Information). A thinker as much as he is a musician, Aloysio Neves explores the antagonism between pre-determined composition and spontaneous music in a CD titled dxy (Audiomaker FW 77002), recorded by a trio comprising Neves on electric & acousitc guitars and alto sax, André Santos on acoustic bass, and Don Camilo on percussion. The first track gets right to the point: “Quibe Cru com Macarronada” (Raw Kibe & Macaroni), whose humorous title implies an Arab-Italian mix, is a serious composition spotlighting a Gismontian guitar executing variations with a strong flamenco tinge. In “Afinação” (Tuning), the electric guitar is employed in free composition, liberated from the constraints of marking time and conventional melody. “Entrevista” (Interview) is a spoken dialogue about the making of music, alternating between earnestness and humor. A long dialogue between sax and strings and sax and percussion follows in “Olhos do Coração” (The Heart’s Eyes), which the composer characterizes as having a Jarrett groove and mixing Arab forms with a touch of Stravinsky. Another piece incorporating speech is “A Fala de Thelonius Monk,” which samples the great jazz master introducing his composition “Panonica.” On the following track , instead of Monk’s tune, we get Aloysio Neves’ “Variantes do Sol”—a melodious excursion into Glauco Velasquez and Villa-Lobos territory, complete with cello-like sonorities. From there it’s back to post-Eric Dolphy free music, juxtaposing atonal elements, clusters, and jazz phrases with virtuosic formal and cadenzal reiterations. The disc concludes with the jazz ballad “Adeus,” composed on the occasion of Dexter Gordon’s death and transmuting his style to that of ECM in the 1970s, where, according to the composer, the romantic lyricism of jazz is still compatible with the contemporary. Cecelo Froni, son of a classical pianist turned physician, began to play acoustic guitar at a young age. At fifteen he began classical studies with Jodacil Damasceno. Disturbed by audience members talking during his performances, he discovered that an electric guitar was louder than the crowd’s chat. He was deeply affected by Alvin Lee of Ten Years After and spent interminable days playing along with the discs of his idols Jimmie Hendrix, Carlos Santana, Eric Clapton, Andy Powell of Wishbone Ash, and Ritchie Blackmore of Deep Purple. His formal studies—theory, harmony, and guitar—continued at the Pró-Arte in his hometown, Teresópolis. He also studied communications. While still a student, he began his professional career as nightclub pianist, although he’d never taken piano lessons. Inspired by Jack Kerouac, Cecelo went on the road—first in southern Brazil, then in Europe, where he lost the fear of being exclusively a musician. Upon his return to Brazil, he began playing with Tavito, who at the time had a successful song called “Rua Ramalhete” (Trio Esperança’s recording is probably the best known). They recorded jingles and commercial soundtracks, an activity which Cecelo considers to have been his real school and which he continues until today. “Making jingles, I learned how to make boleros, sambas, chorinhos, toadas, forrós—genres that had nothing to do with my original education, based as it was on rock and blues guitar,” he says. He also accompanied Fagner, Baby Consuelo, and Sá & Guarabira. More recently, he opened for Carlos Santana in São Paulo. These days, his favorite jazz musicians are John Scofield, Wes Montgomery, Pat Metheny, Pat Martino, Robin Ford, Joshua Redman, Donal Harrison, Nicolas Payton, and the trio Medeski Martin and Wood. Among Brazilian musicians, he’s listened closely to Wilson Simonal, João Donato, Banda Black Rio, and Pixinguinha. 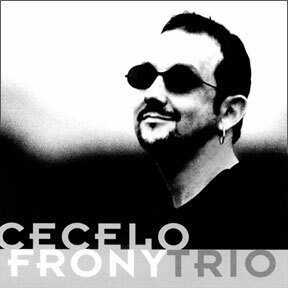 Cecelo is currently recording his second CD, Carioca Samblues, which will synthesize his various fonts of inspiration. The Toca de Lamare Trio was founded fifteen ago at the instigation of bassist Luizão Maia, who sensed a special affinity among Toca de Lamare (piano), Wagner Dias (bass), and Clauton Sales (drums and trumpet). The group’s brand of music is a fusion of classic jazz with Brazilian elements such as samba, bossa nova, and nordestino idioms, reflecting the members’ diverse backgrounds. Toca de Lamare studied music at the Berklee College of Music in Boston and has played in clubs in Tokyo, San Francisco, Mexico City, and Rio de Janeiro. He’s accompanied vocalists such as Tim Maia, Luiz Melodia, and Marina Lima. Wagner Dias is self-taught and comes from the samba world. He’s a member of Luiz Melodia’s band and has played and recorded with João Bosco, Beth Carvalho, Ivan Lins, and Jorge Benjor. His compositions were recorded by Leny Andrade and Emílio Santiago. Like Wagner, drummer/trumpeter Clauton Sales is an autodidact and a Luiz Melodia sideman. Born in Recife, he used to play in Gonzaguinha’s and Geraldo Azevedo’s bands. The trio’s CD, Camaleão (independent), is devoted to original compositions by Toca de Lamare and Wagner Dias—all instrumental with the exception of “Bêbado” (Wagner Dias/Márcio Resende), a song that perfectly describes the Brazilian condition (see lyrics). Originally recorded by Leny Andrade, it is masterfully executed here by Luiz Melodia, with beautiful saxophone improvisations by Vidor Santiago. “Bêbado” is easily the most memorable tune on the album, but there’s more to keep the listener interested. Toca de Lamare’s five tunes all possess strong melodic lines and easy rhythms, including the serene “Mira,” a dialogue between piano and trumpet; “Contente,” featuring Nando Chagas on acoustic guitar; “Olha Aí,” with Nando’s electric guitar; “Dimmer,” with Paulinho Trompete’s flugelhorn in the lead; and “Badlion,” in which Clauton’s trumpet states the theme while Raul Mascarenhas’ saxophone improvises around it. Wagner Dias’ instrumental compositions are equally catchy. “Equinócio,” “Pagode Moderno,” and “Chega Amor” all feature fine electric guitar—the first and third by Ricardo Silveira, the second by Nando Chagas. Throughout, and in addition to stepping in with solid trumpet interventions, Clauton Sales provides a tight rhythmic backbone that makes the listener wonder how he manages to juggle trumpet and drums during the trio’s live shows. Marcelo Paganini is a multi-instrumentalist and composer born in Belo Horizonte, Minas Gerais, and living in Paris. He studied theory at the Conservatório de Belo Horizonte, musicology (abandoned in the second year) at the Sorbonne, and musical computer technology at Ircam. He’s been programming synthesizers for the past 15 years and is a self-taught player of acoustic, electric, and synthesized guitars, bass, keyboards, harmonica, drums, cavaquinho (he has a special 5-string model), as well as singing. A musician open to all styles, Paganini’s experience includes playing in a symphony orchestra, leading a funk/rock band, and arranging an eclectic array of compositions. He records in his home studio, where technology is an indispensable element in most productions. Kimson Plaut isn’t the first American musician to play Brazilian music, but he’s one of the select few who play it as if they were Brazilian. A prolonged residence in Brazil contributed to his profound knowledge—not just of music, but of Brazilian culture, history, and the Portuguese language. Possessing a BA in composition from Yale and an MA in ethnomusicology from the University of Washington, Kimson researched the musical traditions of the Xavante people in Mato Grosso before returning to Brazil, where he lived for over a decade, immersing himself in the music and the culture, performing in a wide variety of musical settings, recording, touring extensively, and heading his own jazz groups in Recife, São Paulo, and Rio de Janeiro. Since his return to New York a decade ago, Kimson has toured regularly in Europe, Asia, South America, Australia, Canada, and the Caribbean, as well as throughout the U.S. In addition to being the pianist for Johnny Almendra and Los Jovenes del Barrio, Kimson has performed and recorded with Brazilian vocalists Astrud Gilberto, Bebel Gilberto, Pery Ribeiro, Ana Caram, and Gabriela Anders; the Latin jazz groups of Patato Valdés, Luis Bonilla, and Ray Vega; and American artists such as Blood, Sweat & Tears and Joan Osborne. He has also recently arranged a symphonic suite for the late Tito Puente and performed on Broadway in Paul Simon’s musical The Capeman. 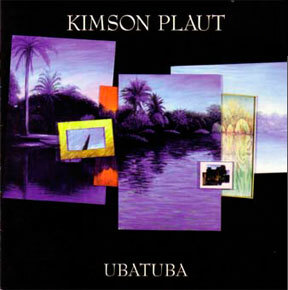 Kimson’s handsomely produced solo CD Ubatuba (LPC Music LPC 01/96) displays his compositorial and arranging acumen alongside many inspired performances by a cast of illustrious guests. The opening track, “Lacraia,” is a piano, saxophone (Steve Sacks, Aaron Heick), trombone (David Sacks), guitar (Romero Lubambo), and percussion (Café) tour de force inspired by the styles of two fine pianists—Cidinho Teixeira and Michel Camilo. The rhythm alternates between partido alto and straight-ahead samba. “Ubatuba” is the name of the composer’s favorite beach town on the São Paulo coast, a place that he says forever transformed his life. Performed by piano, guitar (Paul Meyers), and percussion, the tune is a mellow bossa nova, with “more than a hint of Antonio Carlos Jobim, who sadly passed away while we were finishing up the recording,” recalls Kimson. “Mercado Modelo” is a baião in a style reminiscent of Dori Caymmi or Edu Lobo. It begins and ends with Café playing the berimbau, in homage to the capoeiristas who gather outside the Mercado Modelo in Salvador. Steve Sacks plays flute, and Kimson adds both piano and the de rigueur accordion, backed by typical nordestino clip-clop percussion. 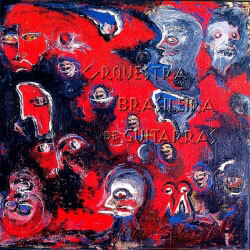 The coda was inspired by Hermeto Pascoal & Quarteto Novo. Kimson calls the next track, “Rice and Beans” (Feijao com Arroz), “my attempt at writing a chorinho. It was the most involved piece we recorded, some five pages long. Paquito [D’Rivera, who plays clarinet] came early to the studio, ran through it three or four times while the engineer was setting up, and proceeded to nail it completely. A brilliant musician.” Rice and beans being the most basic dish in the Brazilian diet, the title refers to the typical everyday Brazilian atmosphere of the track, with Romero’s 7-string guitar and cavaquinho adding that downhome flavor. João Donato needs no introduction. He is probably the single greatest name in Brazilian jazz. A cult figure for many decades, in recent years Donato re-emerged in full force. Since 1995 he’s released a fistful of memorable recordings, including Coisas Tão Simples (EMI/World Pacific) and five CDs on Lumiar Discos, including Café com Pão, the Jobim tribute Só Danço Samba, and the 3-volume Songbook João Donato. With his new disc Amazonas (Elephant Records ER-203), Donato returns to the piano-trio formation that marked the debut of his solo recording career in the early ‘60s. In those days, his sidemen were Tião Neto (bass) and Milton Banana (drums). This trio accompanied João Gilberto at Viareggio (Italy) in 1963 and recorded the legendary LPs A Bossa Muito Moderna de Donato e Seu Trio and Muito à Vontade (both available on cheaply produced CD reissues with the distinct look of pirate knockoffs). On Amazonas, Donato is joined by two equally accomplished sidemen: Jorge Helder, who’s one of Rio’s most sought-after studio bassists, and veteran bossa nova drummer Claudio Slon, whose own Leviev-Slon Quartet can be heard on the CD Jive Sambas and who also plays in Aloisio Aguiar Trio’s To Jobim With Love (both CDs were released on Elephant’s sister label Vartan Jazz). 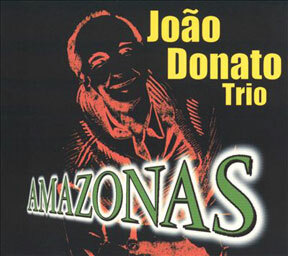 Like every Donato album, Amazonas is a delight. Here the pianist treats us to eighteen of his compositions—some previously recorded by him and (in their lettered versions) by the likes of João Gilberto, Gal Costa, Chico Buarque, Emílio Santiago, João Bosco, and Rosa Passos; others less known. Yet this album is far from being a rehash of old material. The new interpretations are quite different from what we’ve come to know as the Donato style. Since his youth, Donato has been a rapid-fire pianist. Here he chooses to take it easy. Never have we heard Donato so relaxed. A perfect example is “Mentiras,” in which the pianist glides airily over the keys in a trance-like reverie. Compared to the “Sambolero” in A Bossa Muito Moderna, the new recording is slow and mild. But that isn’t to say that Donato has lost his edge; he’s still capable of picking up the tempo when necessary, as in the classic “A Rã,” but the playing is sparer than ever, and the spaces between the notes are more pronounced. Beyond the familiar melodies await lesser known charmers sporting beguiling titles like “Glass Beads,” “Sugar Cane Breeze” (quoting the famous cha-cha-chá “Esperanza”), and “Like Nanai” (Nanai, Elizeth Cardoso’s guitarist and a member of the vocal group Namorados da Lua, was responsible for Donato’s coming to the U.S. in 1959; he came for four weeks and stayed 12 years). Helder and Slon enhance the mellow atmosphere by gently weaving a subdued rhythmic carpet under the piano. While the disc’s music, playing, and sound reproduction are all exemplary, the Amazonas package graphics leave much to be desired. This great artist deserved far better. 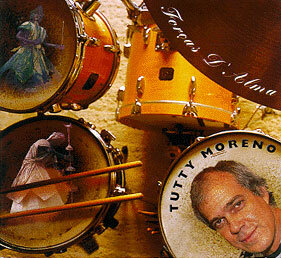 Bahian drummer Tutty Moreno is most often seen and heard accompanying his wife, singer/composer Joyce. However, he has carved out a separate career as a jazz musician in predominantly instrumental settings. In 1996 he joined reedman Teco Cardoso (another fixture in Joyce’s band), pianist Mozar Terra, and bassist Sizão Machado in creating Quarteto Livre. This quartet released the CD Pra Que Mentir? (Lumiar Discos), in which they dressed MPB standards by monstros sagrados like Noel Rosa, Tom Jobim, Joyce, Moacir Santos, and Zé da Zilda in jazz clothing, as well as featuring several original compositions by Mozar Terra. Tutty’s most recent release is Forças d’Alma (Forces of the Soul) from Malandro Records (MAL 71013). 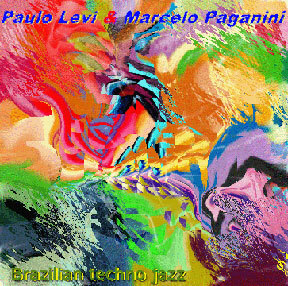 On this disc, he joins soulful forces with bassist Rodolfo Stroeter (the engine behind Pau Brasil, artistic director of Orquestra Jazz Sinfônica of São Paulo State, a busy producer, and another Joyce bandmember), young pianist André Mehmari (winner of the prestigious Prêmio Visa for Instrumental MPB and responsible for this disc’s string arrangements), and ace saxophone/clarinet player Nailor “Proveta” Azevedo. As in Pra Que Mentir? 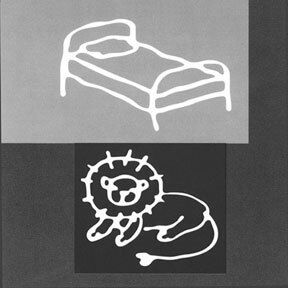 the repertoire of Forças d’Alma consists—this time entirely—of tunes composed by the lions of MPB, with a special place of honor given to another baiano, Dorival Caymmi, who’s represented with four classics: “A Lenda do Abaeté”; “Só Louco”, “João Valentão”; and “A Vizinha do Lado.” Joyce vocalizes with the band in “Baracumbara” and “Forças d’Alma”—both composed by her. Of the remaining four pieces, two (“Alegria de Viver” and “Imagem”) were written by Luiz Eça, one (“Samba Novo”) by Durval Ferreira, and one (“Sanfona”) by Egberto Gismonti. The chief interest here lies not so much in listening to these well-known tunes but in hearing them so expertly transformed into new creations at the hands of Tutty and his brilliant cohorts. There’s nothing like a harmonica to convey saudades, so it’s not surprising that this instrument appears time and again in Brazilian music. Contrabass and harmonica are not a run-of-the mill combination, and when the instrumentalists who wield them are Nilson Matta and Hendrik Meurkens (who also plays vibraphone and marimba), the results are nothing less than dazzling. 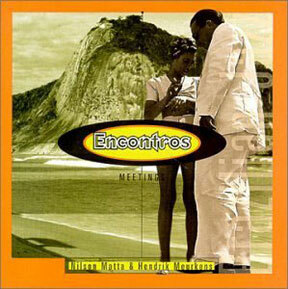 In their CD Encontros, released this summer by Malandro Records (MAL 71015), the pair regales us with their individual compositions, augmented by two standards by Tom Jobim and one by Hermeto Pascoal. Joining this meeting of the minds are superb pianist Helio Alves and drummer Duduka da Fonseca. Special guests include monster guitarist Romero Lubambo (like Duduka, he’s Nilson’s partner in Trio da Paz), pianist Dado Moroni, percussionist Café, and vocalist Maucha Adnet (a longtime member of Jobim’s band). Meurkens contributed four compositions: the lyrically evocative bossa nova “Summer in San Francisco”; the lively choro “Chorinho No. 2”; the jazz ballad “Junity”; and the tone poem turned bossa nova “Prague in March,” in which he demonstrates his mastery of the vibraphone. Nilson Matta weighs in with the jazz samba “Baden,” dedicated to the great guitarist and incorporating a Bach prelude; the bossa nova “Rosa”; the ecological statement within a jazz ballad “Forests (Let Them Be Free)”; and another bossa nova, “This is for Luisa” (previously recorded by Trio da Paz). Both the arrangements and Maucha Adnet’s singing rescue Tom and Vinicius’ war horses “Amor em Paz” and “Chega de Saudade” from the obvious. Hermeto Pascoal’s baião “O Ovo” closes the disc on a chaotically virtuosic note. Vai, sai, cai… do balanço! And the sway, where is it? Where’s that swing that does things to people? So much pain, good Lord! Copyright © 20002014 Daniella Thompson. All rights reserved.